Sports weight yarn and a 3 mm hook. 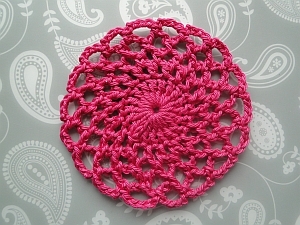 Coaster measures just over 3½"/9 cm wide. Round 1: ch 4, 18 trc into ring; close ring gently; do not join into the 4 ch but ss into 1st trc. Round 2: ch 1, sc into same stitch. (Ch 3, sc into next stitch) 17 times; ch 3, ss into 1st sc to join. Round 3: ss into 1st 3 ch loop; ch 1, sc into same loop. (Ch 3, sc into next loop) 17 times; ch 3, ss into 1st sc to join. Round 4: ss into 1st 3 ch loop; ch 1, sc into same loop. (Ch 4, sc into next loop) 17 times; ch 4, ss into 1st sc to join. Round 5: ss into each of next two chain of 1st loop; 1 sc into same loop. Weave this tail end to the back - I then weave it down to the middle of the coaster and around the center. Then carefully weave in your starting end. 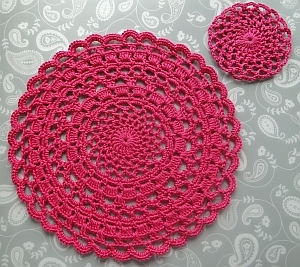 Why not make my Lacy Crochet Doily Pattern? The first five rounds are worked as the coaster, but then you carry on... and on!